"Rome wasn't built in a day..." What does this saying tell us about Rome? 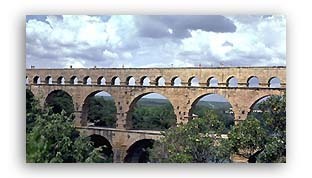 the "Pont du Gard" is in Nîmes, France. Monuments built by Romans are found throughout the Mediterranean and beyond. They were a physical connection between the lands controlled by Rome and Rome herself - "caput mundi" - the capital of the civilized world. Throughout the Empire these structures symbolized the power of Rome. We will look at objects that were made in the city of Rome and in the provinces that formed the Roman Empire. All of these materials will help us discover more about this fascinating civilization. When you're ready to continue, choose one of the themes below!